For the love of God, Jason! RUNNNNNNNNN!!!! 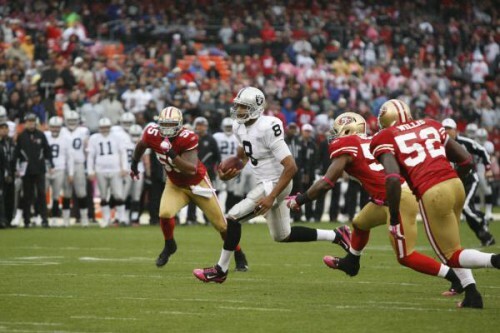 Jason Campbell #8 hurt his knee in the first half but stayed in the game for the duration against the 49ers, probably a bad idea because he completed eight passes for 83 yards with 2 INTs. Campbell finished the day with a 10.7 QB rating, his 2nd worst in history. Jason is out for this week, the 3rd string QB Kyle Boller will start in his place. For the season Jason is 51 of 91 for a 56 completion percentage and 509 yards, 2 TDs and 4 INTs. He has also rushed for 82 yards on 21 carries and been sacked 11 times. Ronnie Brown #23 carried the ball 19 times for 73 yards and caught one pass for 2 yards in the Dolphins’ 23-20 overtime win over the Packers. Ronnie has started all five games this year and has gained 299 yards on 67 attempts this year and has one TD. He has also caught 10 balls for 53 yards. Heath Evans #44 caught a 4-yard pass for a TD this week as the Saints thumped the Bucs in Tampa 31-6. Heath has started every game this year but has only one carry for zero yards and four catches for 33 yards and a TD. Tony Richardson #49 did not record a stat in the Jets 24-20 win over the Broncos. Tony has started at fullback in four games but has only caught two passes for 9 yards this season. Carnell Williams #24 had 10 carries for 18 yards in the league’s worst rushing offense. He did catch seven passes for 63 yards to lead the team in their 31-6 loss to the Saints. Carnell has started all five games and has rushed for 190 yards on 76 carries, a dismal 2.5 yards per carry. He has caught 15 passes for 127 yards. He has yet to score this season. Ben Tate #43 is on injured reserve with the Houston Texans. Devin Aromashadu #19 finally got back on the field this week and caught two balls for 40 yards in the Bears’ 23-20 loss to the Seahawks. Devin has played in three games and started one. He has caught seven passes for 111 yards. Ben Obamanu #87 dressed but played mostly on special teams and did not record a stat in the Seahawks’ 23-20 win over the Bears. Ben has played in every game this year and has caught three passes for 36 yards and a TD this season. Ben Grubbs #66 started against the Patriots in a 23-20 overtime loss. Ben has started every game this year for the Ravens. Marcus McNeill #73 got his first start of the year for the Chargers, unfortunately it was in a 20-17 loss to the Rams. King Dunlap #65 got the first start of his career and had to handle John Abraham of the Falcons. Handle him he did holding the Falcons’ talented end to one tackle and no sacks and winning the NFC East High Energy Player of the Week award! King has played in every game this season with one start. Tyronne Green #69 sat this week after starting the last two games. His Chargers lost 20-17 to the Rams. Tyronne has played in four games this season with two starts. Tim Duckworth #78 was off this week as the winless Panthers try to get back on track. Jay Ratliff #90 had three tackles and got his first sack of the year in the Cowboy’s 24-21 loss to the Vikings. Jay has started every game this year and has 12 tackles, one sack and a pass deflection from his NT spot. Quentin Groves #52 has a pulled hamstring and is day to day. Quentin has started four games this season and has collected 14 tackles, a pass deflection and an INT. Spencer Johnson #91 was off this week with the Bills. Spencer has played every game this year starting one and has 19 tackles and two pass deflections. Pat Sims #90 was off this week with the Bengals. Pat has played in 4 games this season and has 3 tackles and a pass deflection. Sen’Derrick Marks #94 has been nursing a knee injury that kept him out of the game last week. This week he got on the field in the Titan’s Monday night win over the Jaguars, 30-3, but did not record a stat. Sen’Derrick has played in five games this year without a start, he has 9 tackles, a pass deflection and an INT. Karlos Dansby #58 had four tackles in the Dolphins’ OT win over the Packers, 23-20. Dansby suffered what looked to be a bad knee injury but apparently is OK. His foot got caught under a pile and it looked like he may have torn every tendon in his knee but apparently it’s just a hyper-extension. Karlos has 34 tackles and a pass deflection in five starts this year. Will Herring #54 had three tackles in the Seahawks’ 23-20 win over the Bears. Will has 12 tackles and a sack this year and has played in all five games without a start. Takeo Spikes #51 had six tackles and the interception of Jason Campbell that sealed the win for the 49ers, 17-9, over the Raiders. Takeo has started every game this year and has 29 tackles, one interception and three pass deflections. Reggie Torbor #53 was off this week with the Bills. Reggie has played in four games with two starts. He has 11 tackles and two pass deflections. Antonio Coleman #59 was off this week with the Bills. Antonio has played in two games this year and has two tackles. 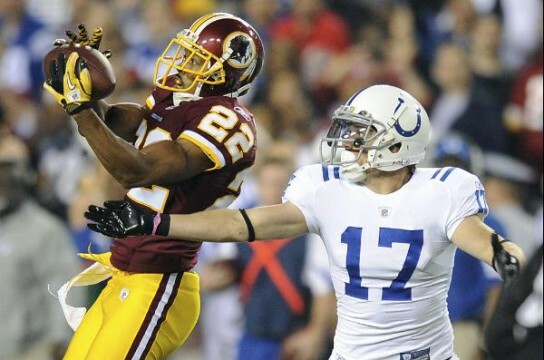 Carlos Rogers #22 recorded seven tackles and two pass deflections in the Redskins’ 27-24 loss to the Colts. Carlos has started every game this year and has 32 tackles, one interception, 9 pass deflections and a forced fumble. Jonathan Wilhite #24 combined on a tackle during the Patriots’ overtime win over the Ravens 23-20. Wilhite has started one game and played in all four this year, he has 14 tackles and a pass deflection. Jerraud Powers #25 had a fantastic game with a whopping 11 tackles, 2 pass deflections and one INT in the Colts 27-24 win over the Redskins. That’s a nice way to go into the bye week. Jerraud has started every game this year and has 34 tackles and 2 INTs. He has also returned 8 punts for 63 yards. Rod Hood #37 is on IR with the Tennessee Titans. Walt McFadden #22 has a pulled hamstring and is out. Walt has only played in one game this season and has one tackle. Pat Lee #22 did not record a stat in the Packers 23-20 overtime loss to the Dolphins. Pat has played in five games this season and has seven tackles. Bironas has gone 11/12 on field goals this year with a long of 55 and is 17/17 on extra points. Damon Duval #15 is on the injured list with the Montreal Allouettes. This season Damon is 30/39 on field goals and 37/37 on extra points for a total of 139 which leads the league. He is also the team’s punter and is averaging 45.2 yards per punt. Thor Burk came to Auburn as a young man in 1997 and never left. He’s always loved Bo Jackson, but his true love of Auburn football proper began in the early 90s. In addition to writing a weekly report on Tiger greats in the NFL, he’s a professional BBQ judge (Memphis certified), and all around foodie. Write to him at [email protected]. Thanks for the updates…I enjoy reading about our former players. Jason getting picked by Takeo: salt in the wound!! Thought Duckworth was cut by Carolina a week ago.